Our professional chimney sweep crew serves all of Windsor Locks CT and Hartford County. Northeastern Chimney, Inc. has maintained an excellent reputation among local residents since our high standards of customer service & workmanship are at the forefront of every job we complete. We have become the trusted source for chimney sweep services in the greater Hartford area, including Windsor Locks CT, Bristol CT, New Britain CT, Southington CT, Farmington CT, and Granby CT.
Every job is completed by CSIA trained and certified chimney sweeps. Every tech goes through rigorous training to ensure that they are completely capable of handling even the most challenging chimney problems. We are fully insured to work on your home and our chimney professionals will always arrive at your home on time, in a company uniform, and in a clearly-marked company truck. You won’t be able to miss our distinctively marked company vehicles as they travel across Rt 401, Rt 140, Rt 75 or Interstate 91, on their way to provide chimney repair services to the Windsor Locks area. NEC receives incredible word-of-mouth recognition from loyal customers who are happy to spread the word about a reliable chimney contractor. We have built a strong network of customers who return to us every year for their annual chimney inspections and cleanings. Ask your neighbors why they choose us for their chimney related service needs. We pride ourselves on being the chimney sweep contractor of choice for Windsor Locks CT and the surrounding towns & villages. Residents have come to count on us to treat them right, and to stand behind the work we do. Our professional chimney sweep techs will always provide a written estimate and give a full explanation of recommended work so homeowners can have a full understanding of what type of work they will receive and why. We are proud to remain good standing members of the National Chimney Sweep Guild. This allows us to stay on top of safety standards, new products, and best practices evolving in the industry. 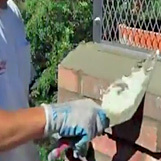 Have you seen an ad promising low prices for a chimney cleaning or inspection? Don’t fall for a common chimney sweep scam! The age-old rule of “you get what you pay for” applies to these cases 100% of the time. These fake chimney “contractors” lure homeowners in with the promise of low prices for common services. Their main goal is to get the job so once on site they can attempt to upsell the homeowners into expensive repairs or services. In most cases, these services aren’t even required or needed, but the scammers know that most homeowners are unaware of the current condition of their chimney & venting system, so they attempt to take advantage of the situation. Don’t pay more and end up getting less than you deserve. Contact a reputable chimney sweep contractor for a second opinion BEFORE you agree to any expensive (and probably unnecessary) repairs. Don't take chances with your home's fireplace, stove and chimney systems - always hire a professional that will do the job right and leave your home and family protected against chimney fires or future chimney problems. Trust in the pros at NEC for all fireplace, insert, stove, or chimney & venting system repairs & services. Top Chimney Sweep company in the Windsor Locks CT area offering the service you deserve.